Living in Northeast Ohio is really like being married. The longer you are here the more your love grows for the region. After time the little things that once irritated you so much, don’t. Like leaving the toilet seat up or down (hey, it works both ways in my opinion) or leaving the cap off the toothpaste. They make tubes now that have the cap permanently affixed in case you were wondering. Sure I got caught in traffic this morning and was late for work, but it could be much more. I could actually live and work in….gulp….New York City. No thanks. I’d rather not live in my vehicle. Sure, I wish Cleveland had better cheese steak sandwiches, but we sure do have the best corned beef sandwiches going. Not to mention pierogies, right? Sure, we here in Cuyahoga County have to get our bi-annual e-check on our vehicles to make for sure that we are not omitting to much toxic fumes into the already toxic atmosphere. Look at it this way, Northeast Ohio has one of the best park systems going anywhere. Sure, our professional sports teams cause us much suffering and pain, but they draw everyone together in this great melting pot of a city. We are rich with ethnicity, so let’s flaunt it. Being in love causes us to overlook the faults and focuses on the good characteristics. Glass half empty? No, glass full! I agree, Cleveland is quite the city. 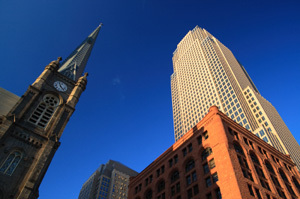 I have lived in NY, Chicago, Atlanta and many more places, but Cleveland is what I call the “Little Big City”. Where else can you go and find all the big city stuff….. Theatre, Night Life, and a wide variety of cultural backgrounds amoung it’s population but not have to put up with all the Big City Stuff like traffic, crime (yes we have crime but not like NY or Chicago). I vote for Cleveland hands down! We have everything one could need or want right here in NEO. Anyone who complains, would have the same complaints anywhere!